This easy-going Georgia couple perfectly illustrate my preferred method of posing for engagement portraits in this photograph. I try not to precisely and intricately position the couples I work with down to every tiny and tedious detail, which can result in a stiff and uncomfortable looking portrait. Instead, after finding a suitable spot in good light to shoot, I'll position the couple, then loosely instruct them how and where to sit, stand, or walk, and simply let them be themselves. This results in a much more natural image that captures their personalities as individuals and as a couple. Admittedly, it can be a little difficult to act natural in this kind of situation, with a camera aimed at you and curious strangers watching as they walk by, but once these distractions are tuned out and cast aside, the results can be magical..It was a bit of an overcast Autumn day, which actually makes for perfect lighting conditions outside. For this shot, I positioned them with the light to their backs, which gives a nice rimlighting effect that helps them stand out from the background. 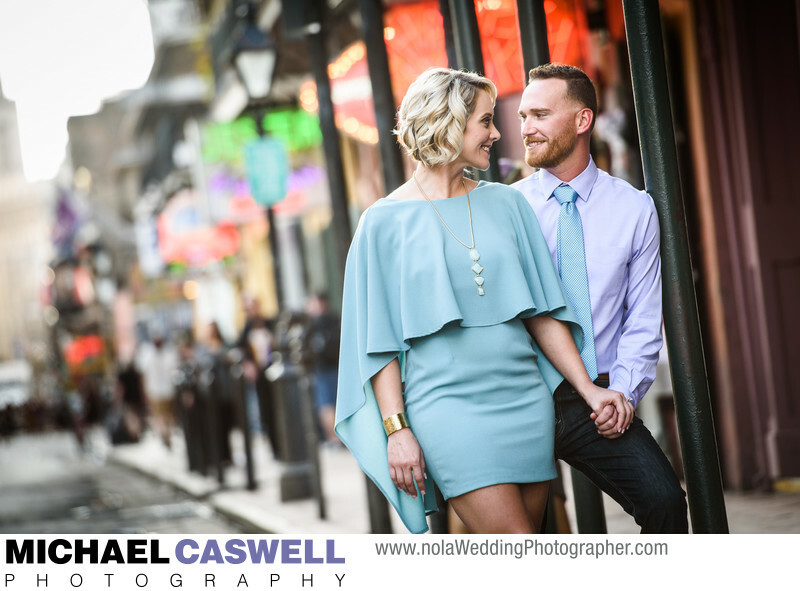 Lens selection also plays a big role in this, by making the background very blurry so that while you can still see the chaos of Bourbon Street, the couple is clearly what draws the viewer's eye.